It’s been a literal number of years since my husband and I have done anything at all to celebrate New Year’s Eve. The last time we agreed to venture out on that particular evening, we were holed up at the house of some people we knew, constantly checking the clock to see how much time had passed since we got there, and if it would be terribly rude for us to bid a hasty retreat, let’s see…right now. It’s not that we are averse to spending time with other people, and it’s not as though we hold any particular grudge against New Year’s Eve as a concept, but it’s just that, in a celebratory sense, I think New Year’s Eve is one of those holidays that sets people up to feel disappointed. Much like Valentine’s Day, the only holiday I think should be actually stricken from existence (seriously—kids not getting Valentine’s Day cards, people thinking their significant other is duty-bound to shower them with trinkets, the horrible, terrible movies—intentionally or not, it’s just designed to make people feel bad about themselves), there seems to be an unnaturally high amount of expectation surrounding New Year’s Eve. As the calendar year begins anew, people are led to believe that so go their lives, their opportunities, and their accomplishments. It is understandable that some people may find it helpful to assign a specific day as the starting point for their goals, but why resign yourself to thinking that there is only one day a year that allows you to make decisions regarding how you’d like your life to change? If you’re going to develop resolve to become a more invested parent, why wait until a particular day to begin that challenge? If you want to become more involved in charity work, it seems wise to start offering your time sooner rather than later. Do you want to save more money? Start now. Go back to school? Okay, so you’ll have to wait until the start of a new term, but, still, if you want to go back to school, go back to school. My feelings about certain foods fall very much in line with my feelings about holidays that are meant to boss people around. I know that Thanksgiving is the holiday of eating turkey and giving thanks, but, really, can’t I have turkey and feel thankful year round? I think I can. And, being as though I hold a particularly strong affection for what my husband refers to as “little bites” (tiny sandwiches, tiny cookies, tiny pies, cracker bites, you get the idea), I think that, cocktail/holiday/New Year’s Eve party be damned, if I want to eat canapés for dinner and ponder the myriad of ways I’d like to help make the world a better place for my son, his son (or daughter) and all those who come before and after, I should go ahead and do so whenever I please. So here’s to the start of not just a new year, but a new way of thinking about the new year and what it means. Your new year can start any time you want it to. 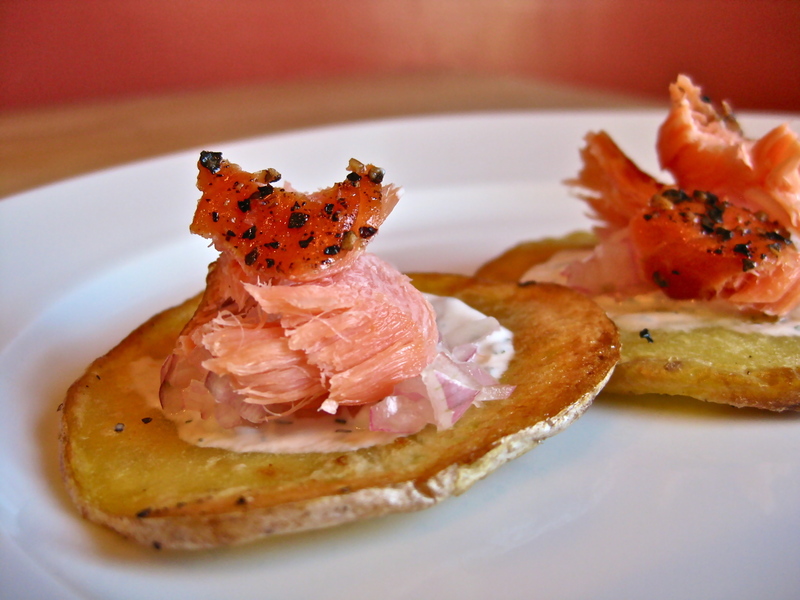 And your dinner of smoked salmon on crisp discs of olive oil roasted potatoes, joined by a creamy dill spread that’s topped with an absolutely heavenly relish of shallots and rice vinegar? Yeah, that can start at any time. To make the potato crisps, preheat oven to 400 degrees Fahrenheit. Move one oven rack to the upper third position, and one rack to the lower third. 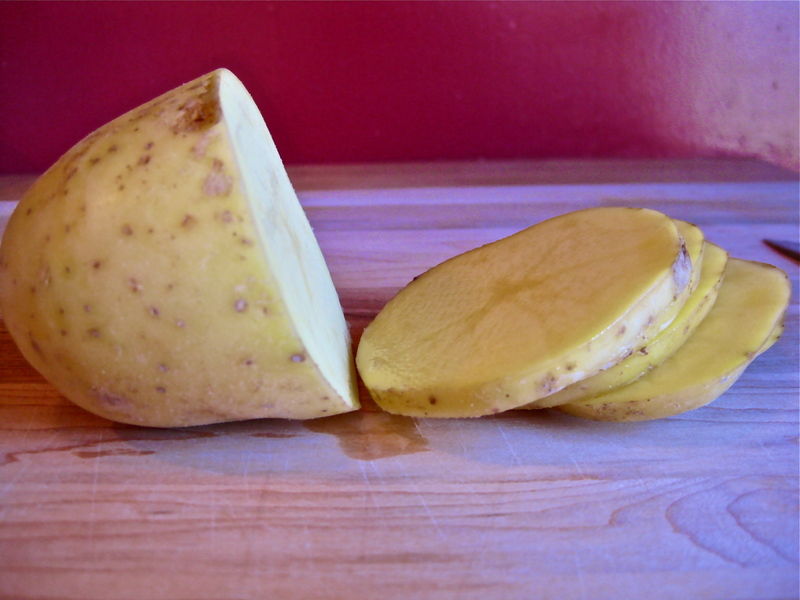 Slice potatoes into ¼-inch rounds. You can use a mandoline slicer to do this, but I find that a very sharp knife works just fine. Divide the olive oil between two baking sheets, drizzling the oil over as much of the surface as possible. 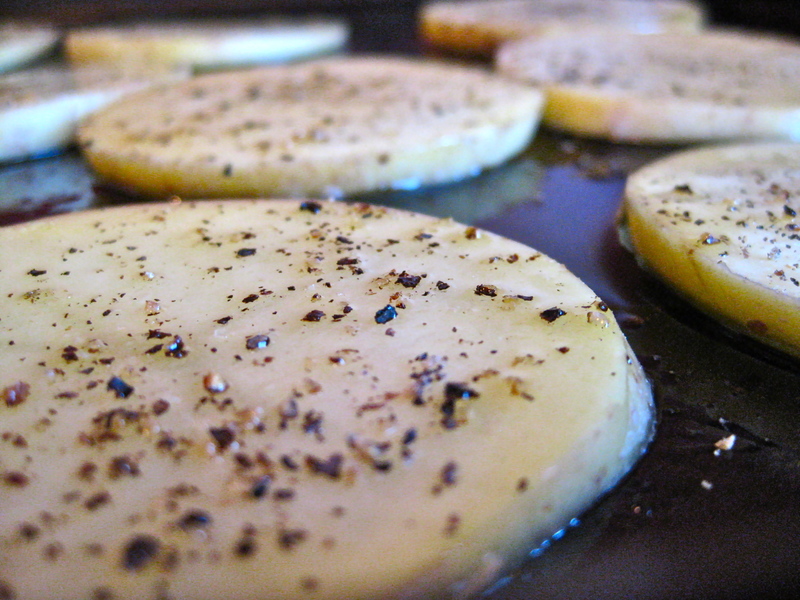 Arrange the potato slices on the oil baking sheets, turning the potato slices over and moving them along the surface of the baking sheet to make sure each slice is well oiled on each side. Sprinkle the potatoes with salt and pepper. Bake the potato slices for 25 minutes, flipping each potato slice halfway through, and also swapping the positions of the baking sheets (so the bottom one is now on top, and vice versa). When the edges of the potatoes are crisp, browned, and sizzling, remove the potatoes to a paper towel-lined plate and set aside to cool. 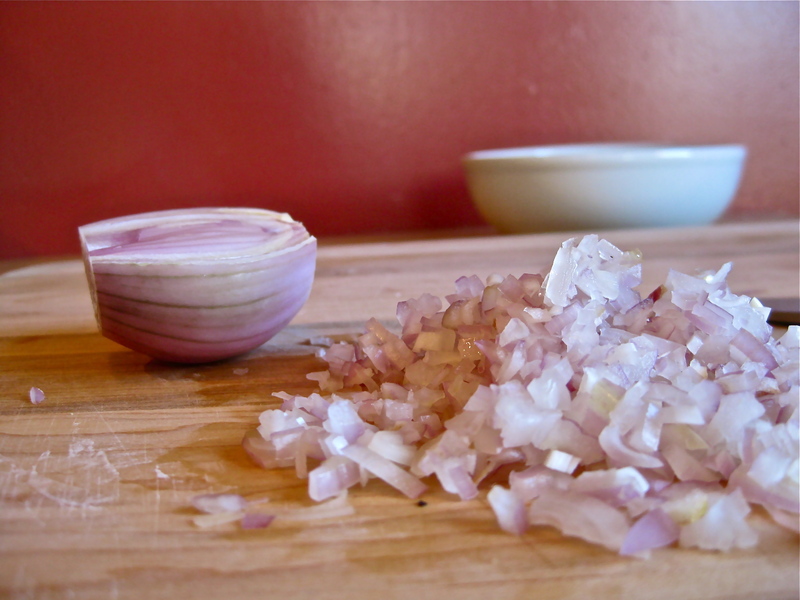 To make the shallot relish, combine all the ingredients in a small bowl, mix thoroughly, then set aside for at least 15 minutes. 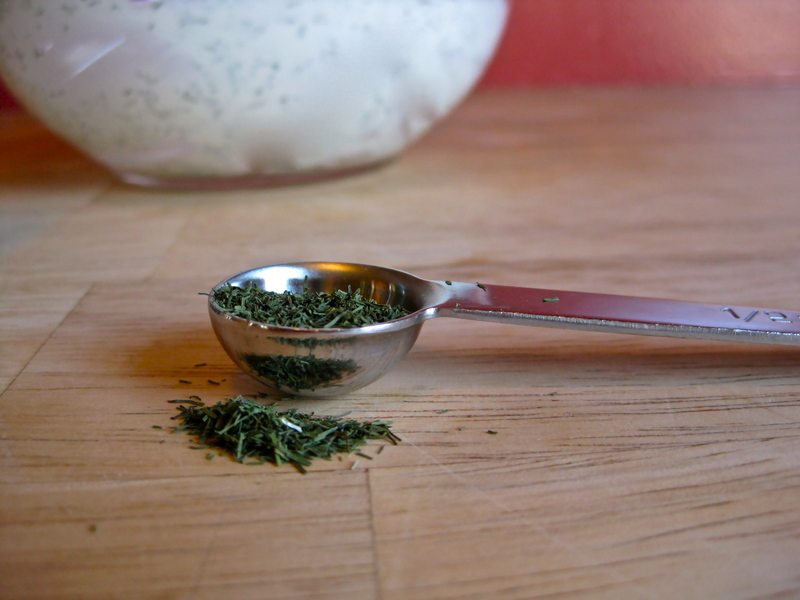 To make the dill spread, combine all the ingredients in a small bowl, and mix thoroughly. 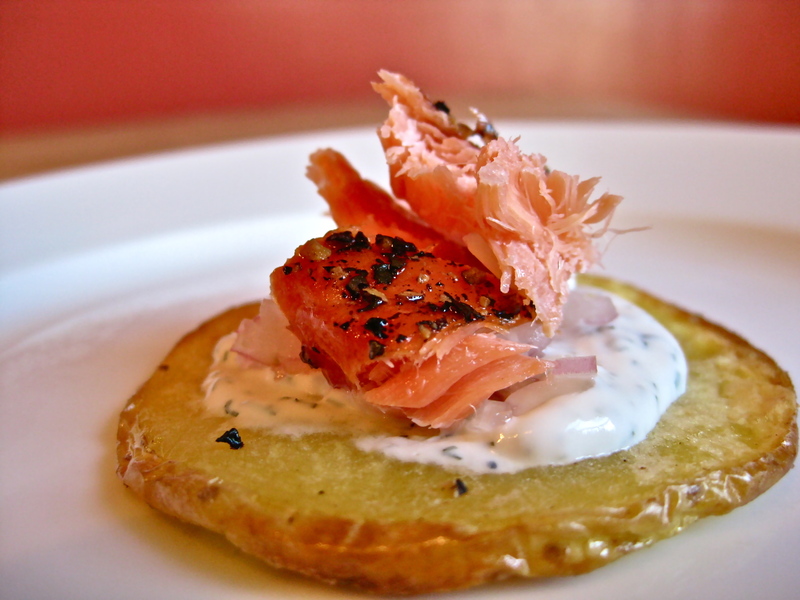 To assemble a canapé, place a small amount of dill spread on top of a cooled potato crisp. 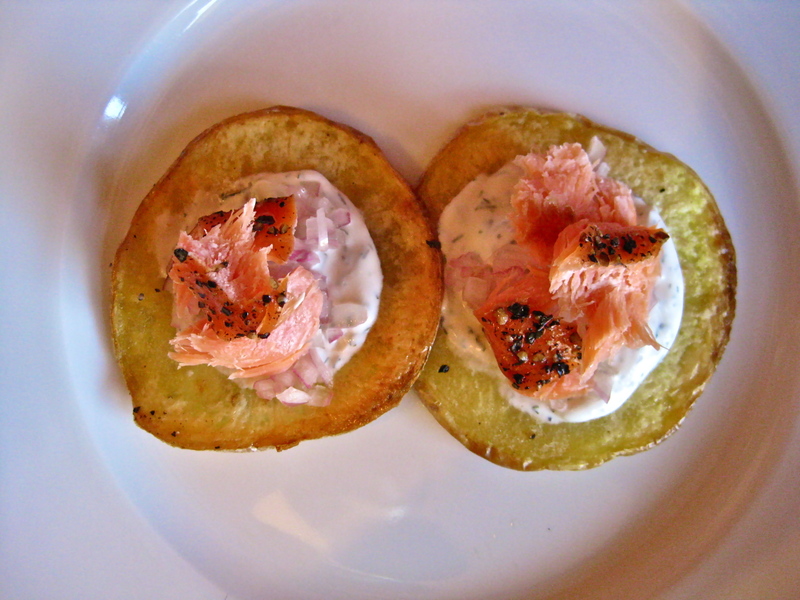 Top the dill spread with a small dollop of shallot relish. 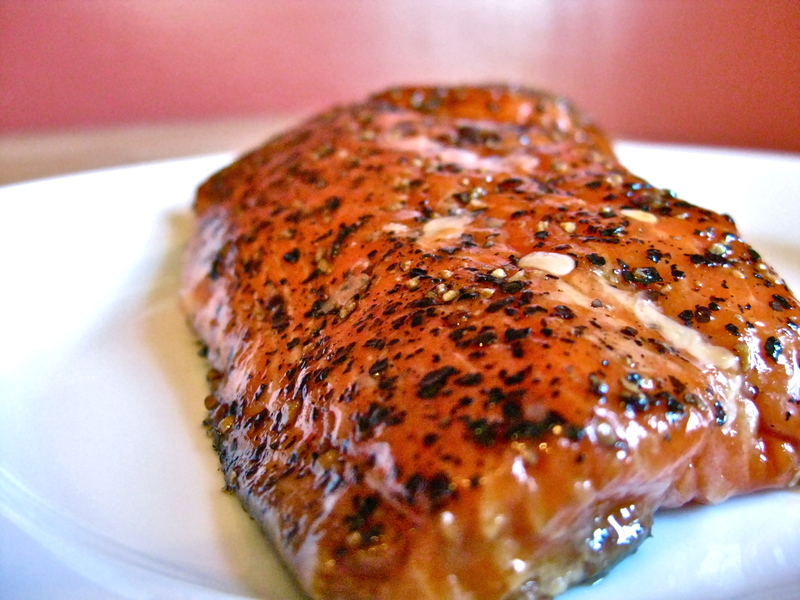 Place a chunk of smoked salmon on top of the relish.